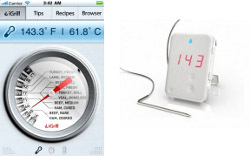 The iGrill remote grilling thermometer. This isn’t available for Android phones yet but I would expect it to be coming. Uses bluetooth to communicate with your phone up to 200 ft. Looks neat for grilling in winter i.e. set it up and then stay in the warmth as grill cooks. Or, of course it is just a neat techie gadget! Posted: December 15th, 2010 under Android.